I first saw this restaurant on a cold rainy Sunday. The place was packed and people were waiting under umbrellas for a chance to sit down. Luckily tonight it was slow and I have throughly enjoyed the peaceful evening. Le Pain Quotidien sits in the heart of the Marais. It triangulates BHV, the grand department store and Quetzal, a popular old gay bar. There’s a steady stream of pedestrians with a soft cacophony of voices and laughter. 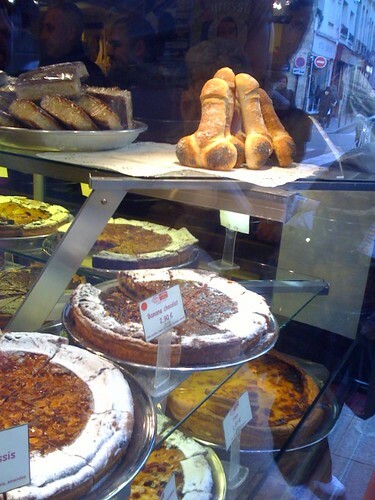 Le Pain Quotidien’s attention to details makes this small boulangerie/bistro a real winner. Everything is presented beautifully and with careful attention. I sat outside in the patio where I was provided not only a space heater, but also a small blanket for my lap. The tables and chairs are simple, yet comfortable. Which explains much of this restaurant’s charm. I especially appreciated individual grinders for sea salt and black pepper, not to mention a nice bottle of olive oil on every table. The menu is rather short, it features a variety of tartines, salads, and casseroles. Much of it is either meat or cheese based, but there are a few salads for the vegans. 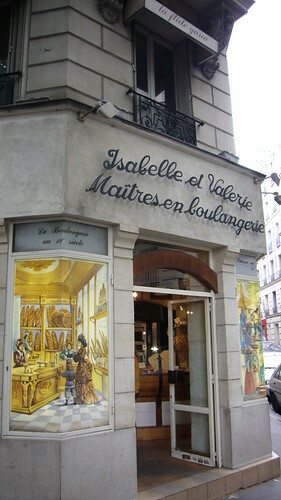 There’s also a selection of pastries inside and a small store of organic items. I recently visited a vegetarian restaurant that featured great food but disappointing bread. Le Pain Quotidien took this organic, whole wheat, daily bread to a whole new level. It was soft, flavorful, and served as not only the foundation for the tartine, but a critical part of its texture and flavor. I ordered the Tartine with chevre, pears, and honey. 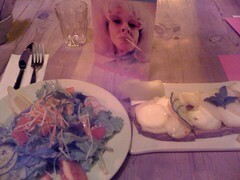 It was served with a nice salad and melon. I followed this with a pot of mint tea. The flavors were clean and distinct. My only criticism is the service. While it was very friendly, the staff ignored the few of us in the outdoor patio. I didn’t mind too much, as i enjoyed the opportunity to relax and catch up on writing cards and working on the computer. Bring a book or a friend to fill the time before appearances. Le Pain Quotidien is a wonderful addition to my list of restaurants. I will certainly return in the future. Note: This is a chain of restaurants in Europe. This review is specific to the Marais restaurant and may not reflect on all of them. The branch in the London train station certainly doesn’t have the same atmosphere or food quality. However, it does feature some nice muffins and coffee/tea.